We’ve studied the Fourier transform quite a bit on this blog: with four primers and the Fast Fourier Transform algorithm under our belt, it’s about time we opened up our eyes to higher dimensions. Indeed, in the decades since Cooley & Tukey’s landmark paper, the most interesting applications of the discrete Fourier transform have occurred in dimensions greater than 1. But for all our work we haven’t yet discussed what it means to take an “n-dimensional” Fourier transform. Our past toiling and troubling will pay off, though, because the higher Fourier transform and its 1-dimensional cousin are quite similar. Indeed, the shortest way to describe the -dimensional transform is as the 1-dimensional transform with inner products of vector variables replacing regular products of variables. In this post we’ll flush out these details. We’ll define the multivariable Fourier transform and it’s discrete partner, implement an algorithm to compute it (FFT-style), and then apply the transform to the problem of digitally watermarking images. As usual, all the code, images, and examples used in this post are available on this blog’s Github page. We spent our first and second primers on Fourier analysis describing the Fourier series in one variable, and taking a limit of the period to get the Fourier transform in one variable. By all accounts, it was a downright mess of notation and symbol manipulation that culminated in the realization that the Fourier series looks a lot like a Riemann sum. So it was in one dimension, it is in arbitrary dimension, but to save our stamina for the applications we’re going to treat the -dimensional transform differently. We’ll use the 1-dimensional transform as a model, and magically generalize it to operate on a vector-valued variable. Then the reader will take it on faith that we could achieve the same end as a limit of some kind of multidimensional Fourier series (and all that nonsense with Schwarz functions and tempered distributions is left to the analysts), or if not we’ll provide external notes with the full details. So we start with a real-valued (or complex-valued) function , and we write the variable as , so that we can stick to using the notation . Rather than think of the components of as “time variables” as we did in the one-dimensional case, we’ll usually think of as representing physical space. And so the periodic behavior of the function represents periodicity in space. On the other hand our transformed variables will be “frequency” in space, and this will correspond to a vector variable . We’ll come back to what the heck “periodicity in space” means momentarily. Now that’s a nasty integral if I’ve ever seen one. But for our purposes in this post, this will be as nasty as it gets, for we’re primarily concerned with image analysis. So representing things as vectors of arbitrary dimension is more compact, and we don’t lose anything for it. And again we have correspondences between algebraic operations: convolution in the spatial domain corresponds to convolution in the frequency domain, the spectrum is symmetric about the origin, etc. At a more geometric level, though, the Fourier transform does the same sort of thing as it did in the one-dimensional case. Again the complex exponentials form the building blocks of any function we want, and performing a Fourier transform on an -dimensional function decomposes that function into its frequency components. So a function that is perfectly periodic corresponds to a Fourier spectrum that’s perfectly concentrated at a point. But what the hell, the reader might ask, is ‘periodicity in space’? Since we’re talking about images anyway, the variables we care about (the coordinates of a pixel) are spatial variables. You could, if you were so inclined, have a function of multiple time variables, and to mathematicians a physical interpretation of dimension is just that, an interpretation. But as confusing as it might sound, it’s actually not so hard to understand the Fourier transform when it’s specialized to image analysis. The idea is that complex exponentials oscillate in the variable for a fixed (and since has as its input, we do want to fix ). The brief mathematical analysis goes like this: if we fix then the complex exponential is periodic with magnitudinal peaks along parallel lines spaced out at a distance of apart. In particular any image is a sum of a bunch of these “complex exponential with a fixed ” images that look like stripes with varying widths and orientations (what you see here is just the real part of a particular complex exponential). Any image can be made from a sum of a whole lot of images like the ones on top. They correspond to single points in the Fourier spectrum (and their symmetries), as on bottom. What you see on top is an image, and on bottom its Fourier spectrum. That is, each brightly colored pixel corresponds to a point with a large magnitude for that frequency component . It might be a bit surprising that every image can be constructed as a sum of stripey things, but so was it that any sound can be constructed as a sum of sines and cosines. It’s really just a statement about a basis of some vector space of functions. The long version of this story is laid out beautifully in pages 4 – 7 of these notes. The whole set of notes is wonderful, but this section is mathematically tidy and needs no background; the remainder of the notes outline the details about multidimensional Fourier series mentioned earlier, as well as a lot of other things. In higher dimensions the “parallel lines” idea is much the same, but with lines replaced by hyperplanes normal to the given vector. Just as with the one-dimensional case, we can do the same analysis and arrive at a discrete approximation of an -dimensional function. Instead of a vector it would be an matrix, where there are terms in the matrix, one for each variable. In two dimensions, this means the discrete approximation of a function is a matrix of samples taken at evenly-spaced intervals in both directions. In the one-dimensional case the inverse transform had a sign change in the exponent and an extra normalization factor. Similarly, in two dimensions the inverse transform has a normalization factor of (1 over the total number of samples). Again we use a capital to denote the transformed version of . The higher dimensional transforms are analogous: you get sums, one for each component, and the normalization factor is the inverse of the total number of samples. Unfortunately, the world of the DFT disagrees a lot on the choice of normalization factor. It turns out that all that really matters is that the exponent is negated in the inverse, and that the product of the constant terms on both the transform and its inverse is . So some people will normalize both the Fourier transform and its inverse by . The reason for this is that it makes the transform and its inverse more similar-looking (it’s just that, cosmetic). The choice of normalization isn’t particularly important for us, but beware: non-canonical choices are out there, and they do affect formulas by adding multiplicative constants. Now one might expect that there is another clever algorithm to drastically reduce the runtime of the 2-dimensional DFT, akin to the fast Fourier transform algorithm (FFT). But actually there is almost no additional insight required to understand the “fast” higher dimensional Fourier transform algorithm, because all the work was done for us in the one dimensional case. But now notice, that we can forget that was ever a separate, two-dimensional function. Indeed, since it only depends on the parameter from out of the sum this is precisely the formula for a 1-dimensional DFT! And so if we want to compute the 2-dimensional DFT using the 1-dimensional FFT algorithm, we can compute the matrix of 1-dimensional DFT entries for all choices of by fixing each value of in turn and running FFT on the resulting “column” of values. If you followed the program from our last FFT post, then the only difficulty is in understanding how the data is shuffled around and which variables are fixed during the computation of the sub-DFT’s. To remedy the confusion, we give an example. Say we have the following 3×3 matrix whose DFT we want to compute. Remember, these values are the sampled values of a 2-variable function. Expanding the definition of as a DFT gets us back to the original formula for the 2-dimensional DFT, so we know we did it right. In the end we get a matrix of the computed DFT values for all . In other words, if the size of the image is , then we are achieving an -time algorithm, which was precisely the speedup that the FFT algorithm gave us for one-dimension. We also know a lower bound on this problem: we can’t do better than since we have to look at every pixel at least once. So we know that we’re only a logarithmic factor away from a trivial lower bound. And indeed, all other known DFT algorithms have the same runtime. Without any assumptions on the input data (or any parallelization), nobody knows of a faster algorithm. Now let’s turn to the code. If we use our FFT algorithm from last time, the pure Python one (read: very slow), then we can implement the 2D Fourier transform in just two lines of Python code. Full disclosure: we left out some numpy stuff in this code for readability. You can view the entire source file on this blog’s Github page. The reader can verify by hand that this is correct (there’s only one nonzero term in the double sum, so it just boils down to figuring out the complex exponential ). We leave it as an additional exercise to the reader to implement the inverse transform, as well as to generalize this algorithm to higher dimensional DFTs. As we did with the 1-dimensional FFT, we’re now going to switch to using an industry-strength FFT algorithm for the applications. We’ll be using the numpy library and its “fft2” function, along with scipy’s ndimage module for image manipulation. Getting all of this set up was a nightmare (thank goodness for people who guide users like me through this stuff, but even then the headache seemed unending!). As usual, all of the code and images used in the making of this post is available on this blog’s Github page. 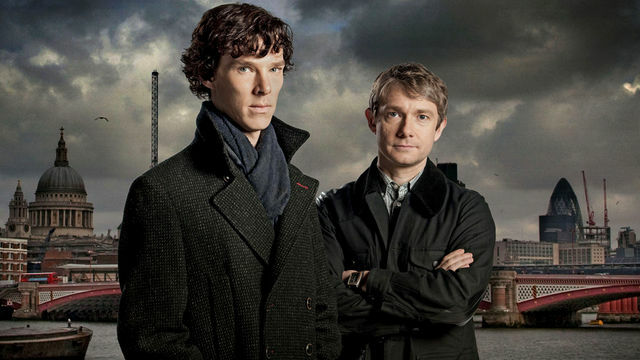 The Fourier spectrum of Sherlock and Watson (and London). A few notes: we use the ndimage library to load the image and flatten the colors to grayscale. Then, after we compute the spectrum, we shift and take a logarithm. This is because the raw spectrum values are too massive; plotting them without modification makes the image contrast too high. 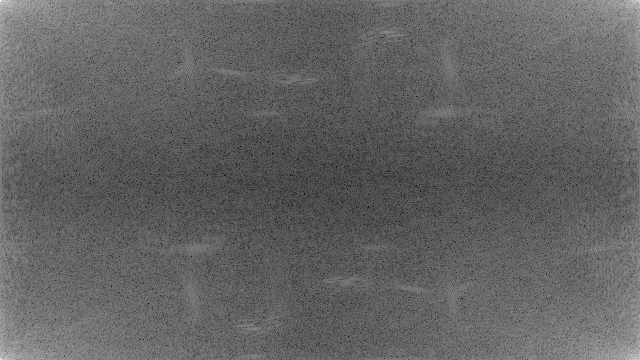 Something is odd, though, because the brightest regions are on the edges of the image, where we might expect the highest-frequency elements to be. 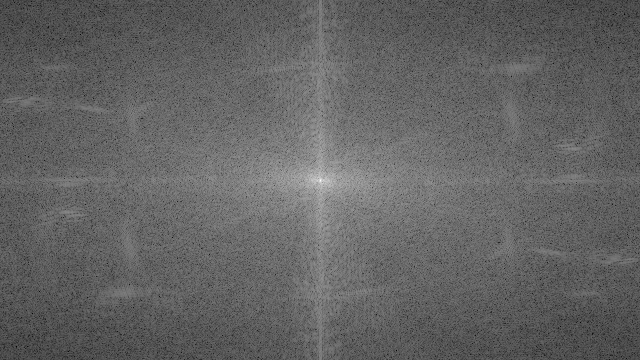 Actually, it turns out that a raw DFT (as computed by numpy, anyhow) is “shifted.” That is, the indices are much like they were in our original FFT post, so that the “center” of the spectrum (the lowest frequency component) is actually in the corner of the image array. 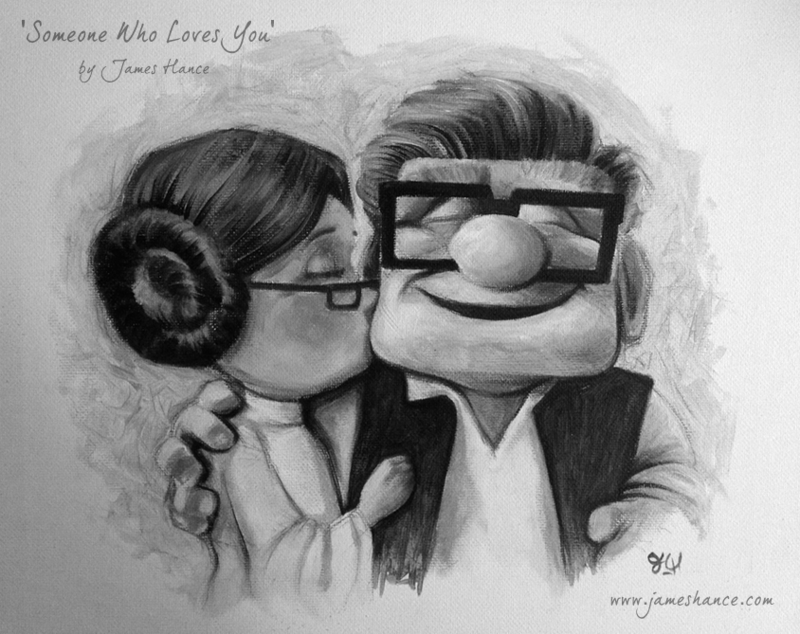 Many thanks to James Hance for his relentlessly cheerful art (I have a reddish version of this particular masterpiece on my bedroom wall). For the interested reader, I followed this youtube video’s recommended workflow to make the time-lapsed movie, along with some additional steps to make the videos play side by side. It took quite a while to generate and process the images, and the frames take up a lot of space. So instead of storing all the frames, the interested reader may find the script used to generate the frames on this blog’s Github page (along with all of the rest of the code used in this blog post). Now we turn to the main application of Fourier transforms to this post, the task of adding an invisible digital watermark to an image. Just in case the reader lives in a cave, a watermark is a security device used to protect the ownership or authenticity of a particular good. Usually they’re used on money to prevent counterfeits, but they’re often applied to high-resolution images on the web to protect copyrights. But perhaps more than just protect existing copyrights, watermarks as they’re used today are ugly, and mostly prevent people from taking the image (paid for or not) in the first place. 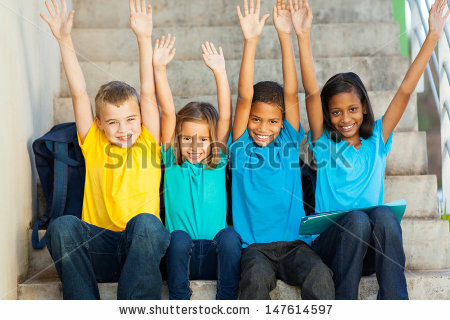 Here’s an example from a big proponent of ugly watermarks, Shutterstock.com. Now if you were the business of copyright litigation, you’d make a lot of money by suing people who took your clients’ images without permission. So rather than prevent people from stealing in the first place, you could put in an invisible watermark into all of your images and then crawl the web looking for stolen images with your watermark. It would be easy enough to automate (Google already did most of the work for you, if you just want to use Google’s search by image feature). Now I’m more on the side of Fair Use For All, so I wouldn’t hope for a company to actually implement this and make using the internet that much scarier of a place. But the idea makes for an interesting thought experiment and blog post. The idea is simply to modify the spectrum of an image by adding in small, artificial frequency components. That is, the watermarked image will look identical to the original image to a human, but the Fourier spectrum will contain suspicious entries that we can extract if we know where to look. Implementing the watermarking feature is quite easy, so let’s do that first. Let’s work again with James Hance’s fine artwork. Pick a radius , a length , a watermark strength , and a secret key . Using as a seed to a random number generator, define a random binary vector of length .  Pick a subset of the circle of coordinates centered at the image’s center of radius , chosen or rejected based on the entries of . Let be the matrix of all zeros (of the same dimension as with 1’s in the entries of . Compute the watermarked image as . That is, compute the DFT of , add to it, and then compute the inverse Fourier transform of the result. It’s hard to see the individual pixels, so click it to enlarge. And then applying a given watermark to an image is super simple. It appears that it’s not until becomes egregiously large (over 10,000) that we visibly notice the effects. This could be in part due to the fact that this is an image of a canvas (which has lots of small textures in the background). But it’s good to keep in mind the range of acceptable values when designing a decoding mechanism. Indeed, a decoding mechanism is conceptually much messier; it’s the art to the encoding mechanism’s science. This paper details one possible way to do it, which is essentially to scale everything up or down to 512×512 pixels and try circles of every possible radius until you find one (or don’t) which is statistically similar to the your random vector. And note that since we have the secret key we can generate the exact same random vector. So what the author of that paper suggests is to extract each circle of pixels from the Fourier spectrum, treating it as a single vector with first entry at angle 0. Then you do some statistical magic (compute cross-correlation or some other similarity measure) between the extracted pixels and your secret-key-generated random vector. If they’re sufficiently similar, then you’ve found your watermark, and otherwise there’s no watermark present. The code required to do this only requires a few extra lines that aren’t present in the code we’re already presented in this article (numpy does cross-correlation for you), so we leave it as an exercise to the reader: write a program that determines if an image contains our watermark, and test the algorithm on various and with modifications of the image like rotation, scaling, cropping, and jpeg compression. Part of the benefit of Fourier-based techniques is the resilience of the spectrum to mild applications of these transformations. Next time we’ll use the Fourier transform to do other cool things to images, like designing filters and combining images in interesting ways. This entry was posted in Algorithms, Linear Algebra and tagged animations, big-o notation, calculus, dimension, fourier analysis, fourier transform, graphics, image manipulation, james hance, mathematics, matrices, programming, python, star wars, Up. Bookmark the permalink. Nice introduction! Robustness to rotation/shifting/moderate scaling seems reasonable and shouldn’t be too hard to prove. Jpeg compression is a bit tricky though, as the results in the paper you cite seem to indicate. If I remember correctly, it processes 8×8 blocks of the image. Therefore robustness probably depends on what frequencies / radius you choose. Small radii / low frequencies are probably less affected by the compression, but then there is also more energy of the original image in them. (Sorry if there is more on how the radius is selected in the article, I have to admit I only had a quick read). Thanks again, I really like reading your blog. I think the paper is conspicuously quiet on how to pick the appropriate radius, but considering how large I was able to scale alpha and still get a non-visible watermark, I think it’s plausible that one could do it with lower frequencies and still get good results. Why advantages would this have over, say, starting the internet for an image with a given hashhash. The past of water marks its too make images unusable, not secretly marked. Nice article ! I already knew the FFT algorithm but not the one used for the 2D-DFT : thanks for your explanations ! Hello, thanks for this article it really helped me. I have a question though, I created the decoding function and calculated co-relation. Now the paper doesn’t mention what value should be used for a correlation threshold, so what should i use generally? Just wondering, would you be able to share the code for the decoding function? I have some questions: Do you just take the real values of the extracted Fourier spectrum values? For resizing to length = r_max * pi, is this for the length of binary elements? Won’t this mismatch the length of row-vector v generated using the original key? Evani i’m having the same doubts about the decoding part, did you ever found out about the length part?